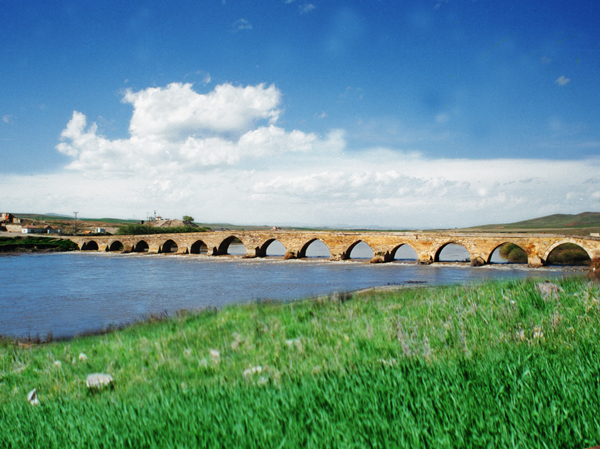 Kesikkopru is one of the bridges built by Seljuk Empire in Middle Anatolia. It is on the way of Kirsehir-Konya, about 20 km to the south of Kirsehir, and across the River Kizilirmak with its 13 parts. In the inscription of bridge, it is written that that bridge was built by Atabeg Izzud Din Muhammad in 646 of the Hegira 1248 of the Christian era during the rule of Keykavus, the son of Keyhusrev. In the 17th and 18th centuries, it took the name of Kesikkopru due to the fact that caravan roads were invaded by the highwaymen. There is a open-air prayer place on the Aksaray side of Kesikkopru. There is also a mihrab constituting from a circular simple niche under the instruction belonging to Ottoman period.